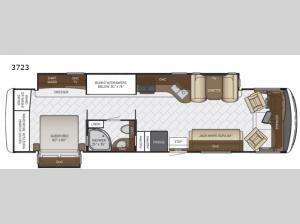 There is a spot for everyone and everything with this 3723 Canyon Star class A motor home! The full wall slide out along the roadside helps to open up the floor space and gives you plenty of room to move around. Your kids will enjoy the 30" x 76" bunk beds, plus additional sleeping space can be found at the dinette and the jack-knife sofa. Mom and dad can retreat to the rear bedroom where you will find a queen bed and plenty of room for your clothes with the dresser and wardrobe. When you want to relax and unwind then come watch a little TV at the living room TV or in the bedroom. In the kitchen there is extra storage space with the two pantries and more!